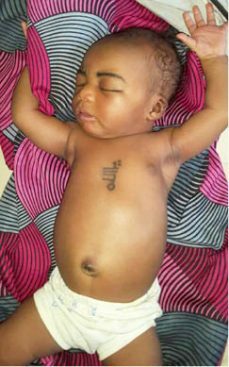 According to a report by Daily Trust, some individuals and groups from within and outside Sokoto metropolis have continued to throng the house of a couple in Sokoto where baby girl was born with an Arabic inscription on her chest, thigh and back as well as crescent sign on her ankle. The miracle baby, who was born March 2, 2019, is the fourth child of her parents who have been married for 16 years now. The father, a Mobile Police officer ,Alhaji Hussaini is based in Katsina. The mother Saratu Yusuf ,24 ,of Garkan Sardauna Sokoto North Local Government told Caliphate Trust that she never experienced anything unusal during the pregnancy. “The pregnancy went very smoothly much more than others. I had no complication, from the beginning to the day I gave birth at Police Clinic along Barth Road Sokoto. The labour started at about 6 am and delivered exactly at 6pm,” she recalled. She added that the baby, who weighed 2.5kg at birth, has remained in good health. As news spread about the phenomenon baby, so do the visitors multiply. She said among the peculiar things discovered on the girl is that she can’t have the earring hole on her ear lobe as after several attempt, the skin could not be pierced. The father, who was in Katsina at the time of the delivery, said on receiving news of the baby, he was so full of anxiety that he could not even sleep on that day. The baby’s naming ceremony is yet to be conducted because of the absence of her father, who was on election duty. However preparations are on for her baby to be formally given a name Saturday March 16. Sultan of Sokoto Muhammad Saad Abubakar was amazed when the baby was taken to his Palace and expressed total submission to Allah for His wonders. The royal father donated N100, 000, a ram, and 5 pieces of clothing materials to the family. The Sultan urged the mother to take good care of the special baby.